Although the terms "laser eye surgery" and "refractive surgery" are commonly used as if they were interchangeable, this is not the case. Lasers may be used to treat nonrefractive conditions (e.g. to seal a retinal tear), while radial keratotomy is an example of refractive surgery without the use of a laser. Cataract surgery is the removal of the lens of the eye that has developed a cataract. The natural lens is then replaced with an artificial intraocular lens. It is one of the safest and most successful procedures in all of medicine. The two main types of cataract extraction are intracapsular cataract extraction (ICCE) and extracapsular cataract extraction (ECCE). Extracapsular cataract extraction involves the removal of the lens while the elastic lens capsule is left partially intact to allow implantation of an intraocular lens. There are two main types of extracapsular surgery: conventional ECCE and phacoemulsification. Conventional extracapsular cataract extraction involves manual expression of the lens through an incision made in the cornea or sclera. Although it requires a larger incision and the use of stitches, the conventional method is indicated for patients with very hard cataracts or lower counts of corneal endothelial cells. Phacoemulsification involves the use of a machine with an ultrasonic handpiece with a titanium or steel needle which vibrates at ultrasonic frequency under continuous irrigation to sculpt, chop and emulsify the cataract, thus making it easier to aspirate the fine particles. Irrigation-aspiration can then be performed with a bimanual system to clean out the cortical matter. Thereafter, a foldable Intraocular lens (IOL) made of Silicone or Acrylic materials of appropriate power is implanted using a holder/folder, or a proprietary insertion device provided along with the IOL. It is placed in the posterior chamber in-the-bag after cleaning out the cataract. Because a smaller incision is required, few or no stitches are needed and the patient's recovery time is usually shorter. .
Intracapsular cataract extraction (ICCE) involves the removal of the lens and the surrounding lens capsule in one piece. The lens is then replaced with an artificial plastic lens (an intraocular lens implant) of appropriate power which remains permanently in the eye. The procedure has a relatively high rate of complications due to the large incision required and pressure placed on the vitreous body, thus is rarely performed in countries where operating microscopes and high-technology equipment are readily available. Cryoextraction is a form of ICCE that freezes the lens with a cryogenic substance such as liquid nitrogen. Although it is now used primarily for the removal of subluxated lenses, it was the favored form of cataract extraction from the late 1960s to the early 1980s. Cataract operations are mostly performed under a local anaesthetic and the patient will be allowed to go home the same day. 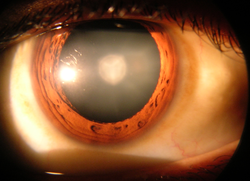 Complications after cataract surgery are uncommon. Many people (up to 50%) can develop a posterior capsular opacification (PCO) after initial cataract surgery, although the incidence is rapidly falling. PCO is a thickening and clouding of the lens capsule (which was left behind when the cataract was removed) and it can be easily corrected using a Nd-Yag laser to make holes in the capsule for the person to see through. Retinal detachment is an uncommon complication of cataract surgery. Previously, polymethylmethacrylate was used as the lens material, since it was discovered by Sir Harold Ridley in UK. He observed that the Royal Airforce pilots sustained eye injuries with splinters of glass from fighter plane windshield (made of PMMA). However, the eyes did not show any foreign body reaction. Thus the material was inert and useful for implantation in the eye. Sir Harold Ridley was the first to design and implant Intraocular lenses, which were further refined by using lathe cutting machines. Advances in technology have brought about the use of silicone and acrylic both of which are soft foldable inert material. This allows the lens to be folded and inserted into the eye through a smaller incision. Polymethyl methacrylate (PMMA) and Acrylic lenses can also be used with small incisions and are a better choice in people who have a history of uveitis, have diabetic retinopathy requiring vitrectomy with replacement by silicone oil or are at high risk of retinal detachment. Acrylic is not always an ideal choice due to its added expense. Latest advances include IOLs with square-edge design, non-glare edge design and yellow dye added to the IOL. Couching was an early form of cataract surgery in which a small probe was inserted in the eye to push the lens down into the posterior chamber. The earliest references to cataract surgery are found in Sanskrit manuscripts dating from the 5th century BC, which show that Susruta in India developed specialised instruments and performed the earliest eye surgery. In the Western world, bronze instruments that could have been used for cataract surgery, have been found in excavations in Babylonia, Greece and Egypt. The first references to cataract and its treatment in the West are found in 29 AD in De Medicinae, the work of the Latin encyclopedist Aulus Cornelius Celsus. In 1748, Jacques Daviel started with modern cataract surgery, in which the cataract is actually extracted from the eye. In the 1940s Harold Ridley invented the intraocular lens which made efficient and comfortable visual rehabilitation possible after cataract surgery. According to surveys of members of the American Society of Cataract and Refractive Surgery, approximately 2.85 million cataracts procedures were performed in the United States during 2004 and 2.79 million in 2005. A trabeculoplasty is a modification of the trabecular meshwork. Laser trabeculoplasty (LTP) is the application of a laser beam to burn areas of the trabecular meshwork, located near the base of the iris, to increase fluid outflow. LTP is used in the treatment of various open-angle glaucomas. The two types of laser trabeculoplasty are argon laser trabeculoplasty (ALT) and selective laser trabeculoplasty (SLT). As its name suggests, argon laser trabeculoplasty uses an argon laser to create tiny burns on the trabecular meshwork. Selective laser trabeculoplasty is newer technology that uses a YAG laser to target specific cells within the trabecular meshwork and create less thermal damage than ALT. An iridotomy involves making puncture-like openings through the iris without the removal of iris tissue. Performed either with standard surgical instruments or a laser, it is typically used to decrease intraocular pressure in patients with angle-closure glaucoma. A laser peripheral iridotomy (LPI) is the application of a laser beam to selectively burn a hold through the iris near its base. LPI may be performed with either an argon laser or Nd:YAG laser. An iridectomy, also known as a corectomy or surgical iridectomy, involves the removal of a portion of iris tissue. A basal iridectomy is the removal of iris tissue from the far periphery, near the iris root; a peripheral iridectomy is the removal of iris tissue at the periphery; and a sector iridectomy is the removal of a wedge-shaped section of iris that extends from the pupil margin to the iris root, leaving a keyhole-shaped pupil. Penetrating filtering surgeries are further subdivided into guarded filtering procedures, also known as protected, subscleral, or partial thickness filtering procedures (in which the surgeon sutures a scleral flap over the sclerostomy site ), and full thickness procedures . Trabeculectomy is a guarded filtering procedure that removes of part of the trabecular meshwork. Full thickness procedures include sclerectomy, posterior lip sclerectomy (in which the surgeon completely excises the sclera on the area of the sclerostomy ), trephination, thermal sclerostomy (Scheie procedure), iridenclesis, and sclerostomy (including conventional sclerostomy and enzymatic sclerostomy)  . Non-penetrating filtering surgeries do not penetrate or enter the eye's anterior chamber  . There are two types of non-penetrating surgeris: Bleb-forming and viscocanalostomy . Bleb forming procedures include ab externo trabeculectomy and deep sclerectomy. Ab externo trabeculectomy (AET) involves cutting from outside the eye inward to reach Schlemm's canal, the trabecular meshwork, and the anterior chamber. Also known as non-penetrating trabeculectomy (NPT), it is an ab externo (from the outside), major ocular procedure in which Schlemm's canal is surgically exposed by making a large and very deep scleral flap. The inner wall of Schlemm's canal is stripped off after surgically exposing the canal . Deep sclerectomy, also known as nonpenetrating deep sclerectomy (PDS) or nonpenetrating trabeculectomy is a filtering surgery where the internal wall of Schlemm's canal is excised, allowing subconjunctival filtration without actually entering the anterior chamber ; it is commonly performed with the Aquaflow® collagen wick . Viscocanalostomy is also an ab externo, major ocular procedure in which Schlemm's canal is surgically exposed by making a large and very deep scleral flap. In the VC procedure, Schlemm's canal is cannulated and viscoelastic substance injected (which dilates Schlemm's canal and the aqueous collector channels). Tube-shunt surgery or drainage implant surgery involves the placement of a tube to facilitate aqueous outflow from the anterior chamber . Trabeculopuncture uses a Q switched Nd:YAG laser to punch small holes in the trabecular meshwork with  . Goniocurretage is an "ab interno" (from the inside) procedure that used an instrument "to scrape pathologically altered trabecular meshwork off the scleral sulcus"  . A surgical cyclodialysis is a rarely used procedure that aims to separate the ciliary body from the sclera to form a communication between the suprachoroidal space and the anterior chamber. A cyclogoniotomy is a surgical procedure for producing a cyclodialysis, in which the ciliary body is cut from its attachment at the scleral spur under gonioscopic control. Certain cells within the eye's ciliary body produce aqueous humor. A ciliary destructive or cyclodestructive procedure is one that aims to destroy those cells in order to reduce intraocular pressure . Cyclocryotherapy, or cyclocryopexy, uses a freezing probe . Cyclophotocoagulation, also known as transscleral cyclophotocoagulation, ciliary body ablation,, cyclophotoablation , and cyclophototherapy , uses a laser. Cyclodiathermy uses heat generated from a high frequency alternating electric current passed through the tissue, while cycloelectrolysis uses the chemical action caused by a low frequency direct current. Oculoplastic surgery, or oculoplastics, is the subspecialty of ophthalmology that deals with the reconstruction of the eye and associated structures. Enucleation is the removal of the eye leaving the eye muscles and remaining orbital contents intact. Evisceration is the removal of the eye's contents, leaving the scleral shell intact. Usually performed to reduce pain in a blind eye. Exenteration is the removal of the entire orbital contents, including the eye, extraocular muscles, fat, and connective tissues; usually for malignant orbital tumors. A corectomedialysis, or coretomedialysis, is an excision of a small portion of the iris at its junction with the ciliary body to form a artificial pupil. ↑ Meadow, Norman B. Cryotherapy: A fall from grace, but not a crash. Ophthalmology Times. October, 15, 2005. ↑ a b Cassin, B. and Solomon, S. Dictionary of Eye Terminology. Gainesville, Florida: Triad Publishing Company, 1990. ↑ a b Cvetkovic D, Blagojevic M, Dodic V. ["Comparative results of trepanotrabeculectomy and iridencleisis in primary glaucoma."] J Fr Ophtalmol. 1979 Feb;2(2):103-7. PMID 444110. This page was last edited on 19 March 2018, at 17:48.